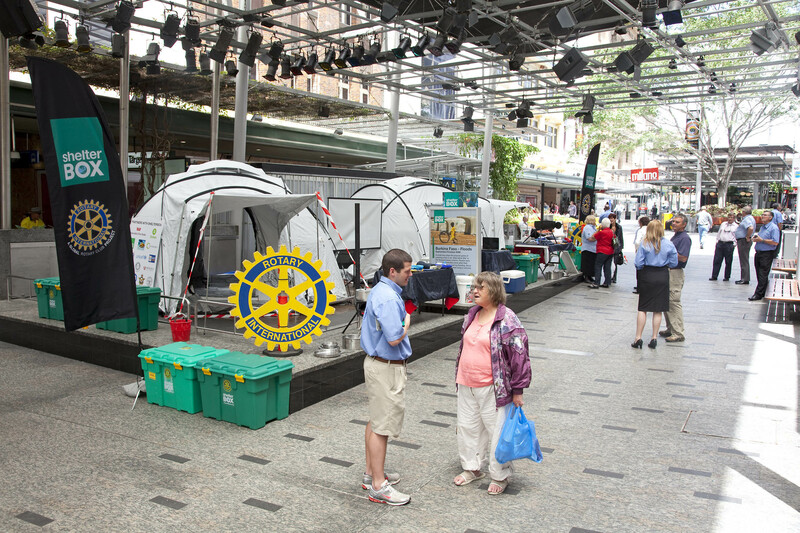 ShelterBox Australia took over Brisbane’s Queen Street Mall for the day yesterday with an eye-catching and informative display. Given the use of the performance area between 7.00am and 3.00pm, 2 relief tents were erected, along with displays of box contents, frontier stoves (complete with “special effects” fires and “boiling” pans of water. On hand were a team of ShelterBox Response Team (SRT) members and Rotarians to explain the work of ShelterBox and answer questions. Over 1,000 information leaflets were handed out to willing recipients (including Big Sam Thaiday of the Broncos & Kangaroos), several potential volunteers and SRT were recruited and a nice bit of cash collected. This entry was posted in Shelterbox and tagged brisbane, disaster relief, Queen Street Mall, Rotary, Shelterbox, Shelterbox Australia, SRT. Bookmark the permalink.